I love Indian food – and thankfully good Indian food is plentiful in London. There are some amazing restaurants, ranging from the really expensive to the really reasonable, but since I hardly ever go out (I can hear a violin playing a plaintive tune) I can’t really recommend any to you. My husband and I will indulge in Indian takeaway at least a couple of times a month – especially when we get busy. But the last time we ordered in from usual place the meal was a huge disappointment, which made me all kinds of cranky. So, I decided to try a couple of our favourites in our pressure cooker and I am now pretty sure I won’t be ordering in again! Yup, pressure cooker lamb Dhansak is GOOOOD you guys. So, so good. Let’s be open and upfront about one thing here… I can’t claim this lamb Dhansak curry is in any way authentic. I only know that it tastes really good and it is really easy, especially in a pressure cooker. It uses spices that I always have handy: ground cumin, turmeric and coriander, along with one I use relatively rarely, cardamom pods. You can buy ground cardamom, but it really doesn’t taste even remotely similar to grinding the little seeds from the pods yourself. As with all spices it is best to use them fresh – don’t go using a little tub that has been gathering dust since you remodelled your kitchen five years ago, it just won’t taste of anything. Buy small pots or bags of spices and use them quickly, or at least replace them often. Sear the lamb either in the Instant Pot or in a large pan, in batches, so it has a chance to really brown instead of stew. Set the lamb aside – or transfer to a bowl. Add more oil in your Instant Pot and cook the onions for 5 minutes, stirring so that they don’t stick. Add the minced garlic, spices, salt and ginger and stir for a couple of minutes – already your curry will start smelling amazing. Return the browned lamb to the pot and add the split red lentils, tinned tomatoes, stock, chilli, cinnamon stick and bay leaf. Give it a little stir, cover and cook at high pressure for 20 minutes. Let the steam release naturally for 10 minutes, then manually release the rest. Taste and check the seasoning – I found that my curry needed a touch of sweetness, so I added a little honey. This is just my personal preference though and entirely optional. Your curry will be now ready, delicious and naturally thickened by the red lentils – no cornstarch required here! Serve it with steamed basmati rice or pilau rice, maybe topped with a little yoghurt and a scattering of coriander leaves. Meet your new favourite dinner! This pressure cooker lamb Dhansak curry is delicious, so easy and mild enough for the whole family to enjoy. Split the cardamom pods and reserve the little seeds. Crush them in a pestle and mortar. 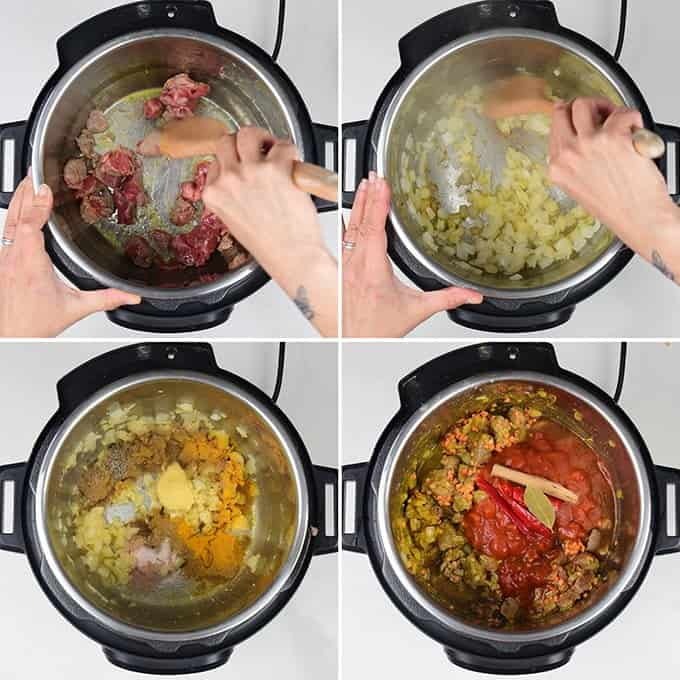 Heat 1-2 tbsp oil in your Instant Pot using the ‘sauté’ function or in a large pan and brown the lamb, in batches. Set aside. Add a little more oil in the pressure cooker and sauté the onions for 5 minutes, stirring. Add the garlic, all the spices, salt and ginger and stir. Return the lamb to the pot and stir in the lentils. Add the tomatoes, stock, cinnamon stick and bay leaf and stir to combine. Cover, set vent to sealing and cook for 20 minutes at high pressure. Let the pressure release manually for 10 minutes, then manually release the rest. Taste the curry and season with salt and pepper. Add a little honey if it needs a touch of sweetness. Serve over rice garnished with fresh coriander (cilantro). You could bulk up this recipe by adding 200g (1 cup) of lentils. Also got the burn notice despite deglazing. New to Instant Pot. This is my third recipe. Smells great! I read that with tomato or thick bases, the best thing to do is to deglaze with the broth, and DO NOT stir, but simply pour the thicker sauces over the top. Hopefully that will help anyone getting the burn notice. Thanks for the feedback – haven’t had that problem myself for some reason. so good! I needed something for dinner that didn’t require a big shop – I had everything for this, so winner-winner! Really tasty, will make again! We do have some leftovers (just two of us) – wonder if it would freeze ok? Hiya – sorry for late reply was away for a week. I think it would freeze well! The best curry I have cooked so far and I’ve cooked a few….thank you I’ll be doing this again. I am so sorry to hear that. I didn’t have any issues when I cooked it so I am perplexed. Let me know how it turned out. Yes I am pretty sure it would be perfect for the slow cooker! Oh Esha thank you so much! It tastes pretty amazing thats the important thing!